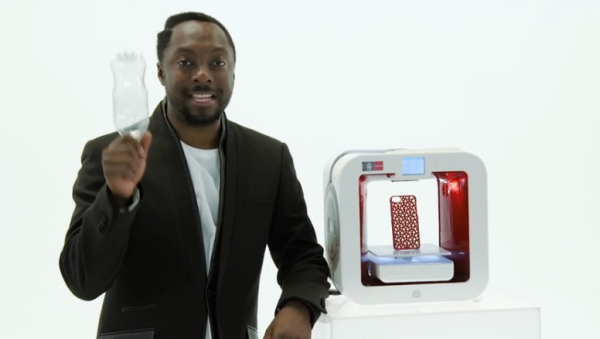 Coca-Cola, 3D Systems, and 3D Systems’ Chief Creative Officer, will.i.am of Black Eyed Peas present a 3D printer that uses recycled plastic Coca-cola bottles as filament. The 3D printer is called EKOCYCLY Cube. The filament, rPET, is a flexible filament that consists of 3 used Coca-Cola bottles. Twenty-five percent of the filament is made of recycled plastic, yet still retains its durability. Available colors include red, black, white, and natural. EKOCYCLE is $1,199 and includes a free collection of 25 fashion, music, and tech accessories, created by will.i.am. The printer features 70-micron resolution and up to 6 inches cubed in sized, with supports and auto settings. The printer has two extruders and has Wi-Fi and Bluetooth connectivity. “The EKOCYCLE is not just another tool for making, it is a revolutionary tool for RE-making, and encourages and helps us to change the way we think about recycling,” stated 3D Systems. EKOCYCLE Cube printers are expected to start shipping during the second half of 2014.